Apologies to everybody! This post was due on December 1st but I have had mega problems with Blogger. It would not allow me add pictures from my folders. It kept pointing me to "online storage" and saying the facility was unavailable. I don't store anything online so couldn't work it out. Have tried for a couple of days but no luck. Anyway, opened Blogger today and everything was back to normal. Go figure!! Flipping Blogger! So here is my post - albeit two days late!! Good morning to you all. Well it's a nice bright morning after all the rain - and no wind! Thank goodness. Well for my "3-in-a-row" card it's my DT card for Crafty Time. Our last challenge of 2015 is very easy - Anything Goes so we hope you will join in the fun with us. The image I have used is Minako, Oriental Maiden and I think this is a gorgeous image. Well I must be off. Hope everybody is well. Take care. A gorgeous card, fab image and beautiful die cut details. Sorry you've had so much trouble Christine, it's very frustrating. glad it's ok now though. Hello Christine, I am having the same computer problems. Hopefully mine will be resolved as well. I am right Texhnophobe and had not a clue. I love your beautiful card, the image is adorable and your design is is brilliant. 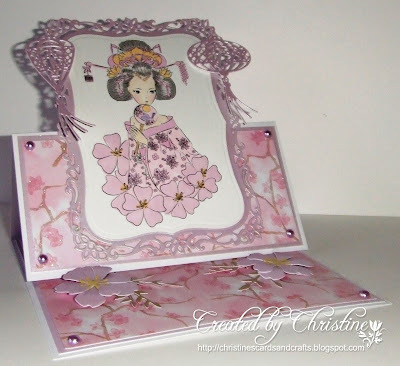 Hello Christine, what a beautiful card, I love anything Oriental of course. Lovely image and papers, beautiful design too. Ooooh, the times I've had issues with Blogger! Glad you got sorted so you could share this terrific card.